Progress: 63.8% of goal. Let's raise $4,500! I spent far too long last night making a video for you, my faithful readers, not to post it. Alas, not having interwebs at home complicates things. So be on the look out for a post this afternoon from Chicago, or maybe even from LaGuardia. Do they have free WiFi? For the time being check out my breakfast. 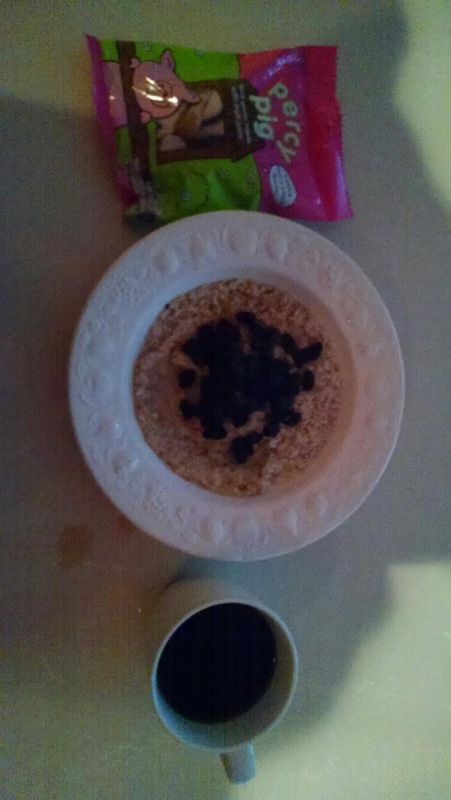 I don't actually know if it is what the champs eat, but it is good, warm, and cheap.If you can't tell through the potato quality of the photo I'm enjoying goat-meal with raisins. Oh, and I don't usually down an entire bag of Percy Pigs, not that I couldn't, but my roommate gave me those for the plane and good luck! I'm almost packed. I have my shorts, energy gels, and anti-chafing products. Really, the only other things I need is a strong, stable, and happy digestive system and a bit of good luck. Oh, and before I forget, go donate to HOME today! It is wonderful to know that there are people who realize there are people in need hiding right in our midst. I am so pleased that you all have been so generous in supporting low income seniors. Thank you.